Is the Armenian foreign policy still complementary? Ukrainian crisis: will it change the conjuncture of interests in South Caucasus? 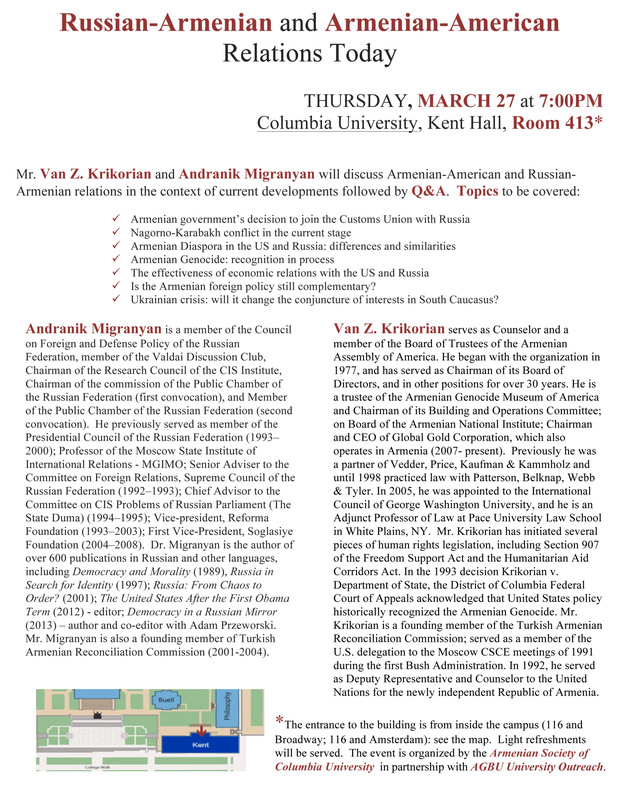 The event will take place on Thursday, March 27, 7:00PM at Columbia University, Kent Hall room 413 (The entrance of the building is from inside the campus: see the map). For more details, please see the flyer. Andranik Migranyan is a member of the Council on Foreign and Defense Policy of the Russian Federation, member of the Valdai Discussion Club, Chairman of the Research Council of the CIS Institute, Chairman of the commission of the Public Chamber of the Russian Federation (first convocation), and Member of the Public Chamber of the Russian Federation (second convocation). He previously served as member of the Presidential Council of the Russian Federation (1993–2000); Professor of the Moscow State Institute of International Relations – MGIMO; Senior Adviser to the Committee on Foreign Relations, Supreme Council of the Russian Federation (1992–1993); Chief Advisor to the Committee on CIS Problems of Russian Parliament (The State Duma) (1994–1995); Vice-president, Reforma Foundation (1993–2003); First Vice-President, Soglasiye Foundation (2004–2008). 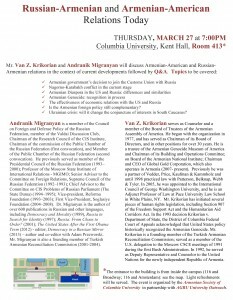 Dr. Migranyan is the author of over 600 publications in Russian and other languages, including Democracy and Morality (1989), Russia in Search for Identity (1997); Russia: From Chaos to Order? (2001); The United States After the First Obama Term (2012) – editor; Democracy in a Russian Mirror (2013) – author and co-editor with Adam Przeworski. 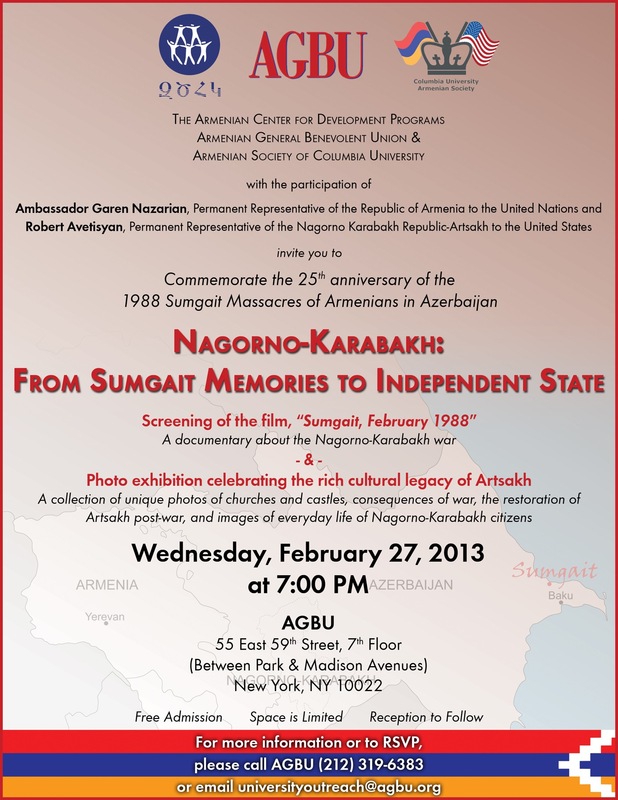 Mr. Migranyan is also a founding member of Turkish Armenian Reconciliation Commission (2001-2004). Van Z. Krikorian serves as Counselor and a member of the Board of Trustees of the Armenian Assembly of America. He began with the organization in 1977, and has served as Chairman of its Board of Directors, and in other positions for over 30 years. He is a trustee of the Armenian Genocide Museum of America and Chairman of its Building and Operations Committee; on Board of the Armenian National Institute; Chairman and CEO of Global Gold Corporation, which also operates in Armenia (2007- present). Previously he was a partner of Vedder, Price, Kaufman & Kammholz and until 1998 practiced law with Patterson, Belknap, Webb & Tyler. In 2005, he was appointed to the International Council of George Washington University, and he is an Adjunct Professor of Law at Pace University Law School in White Plains, NY. Mr. Krikorian has initiated several pieces of human rights legislation, including Section 907 of the Freedom Support Act and the Humanitarian Aid Corridors Act. In the 1993 decision Krikorian v. Department of State, the District of Columbia Federal Court of Appeals acknowledged that United States policy historically recognized the Armenian Genocide. Mr. Krikorian is a founding member of the Turkish Armenian Reconciliation Commission; served as a member of the U.S. delegation to the Moscow CSCE meetings of 1991 during the first Bush Administration. In 1992, he served as Deputy Representative and Counselor to the United Nations for the newly independent Republic of Armenia. Komitas, Tchuhadjian, Manas, Alemshah, Sinanian, and Kanachian. 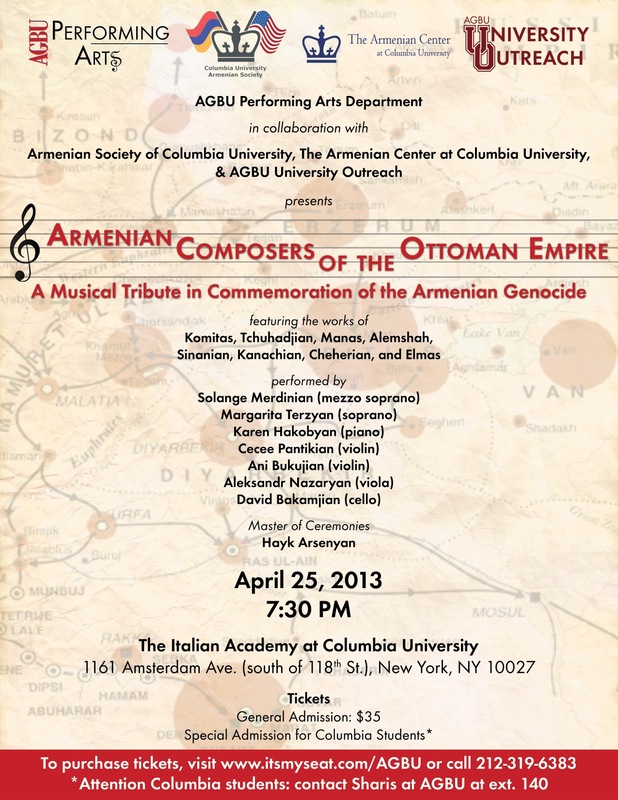 The concert will take place on Thursday, April 25th at 7:00pm in Italian Academy Teatro. For tickets click here. CUID call 212-319-6383 for special admission. In response to the plight and suffering of our compatriots in Syria, the Armenian youth in the tri-state area has organized a fundraising concert to take place at Felician College in Lodi, NJ on April 6th at 7:00pm. 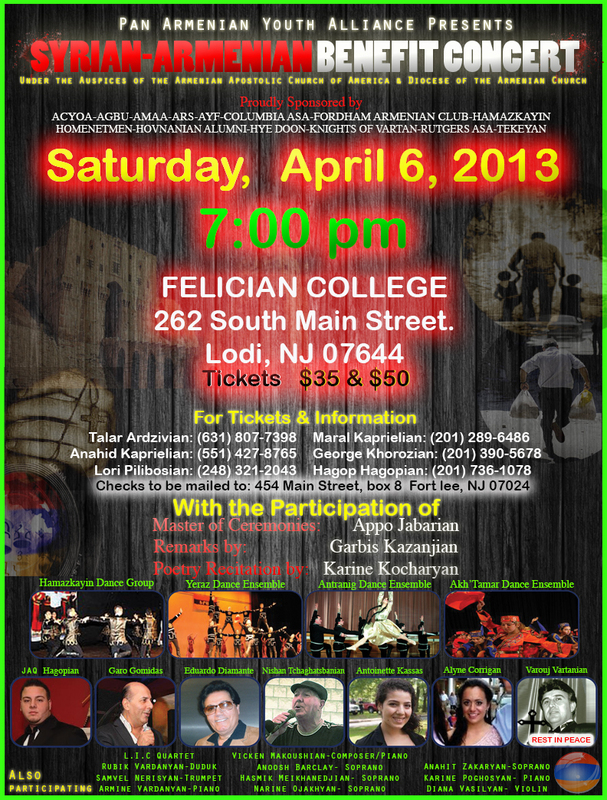 A varied but united collection of performers and artists, some of whom you may personally know, have volunteered to take part in the concert to help benefit the Syrian-Armenian community. Please see the concert flyer and application for advertising in the program booklet for further details and contact information. In case you, or someone you know, wants to advertise in front 1400 people, it’s an excellent way for a business to gain exposure and make a tax-deductible donation. For tickets and more details, feel free to contact through email or call one of the following numbers indicated on the flyer. You can also RSVP through facebook. The story of Adam Derderian, a hip, 27-year old bar owner, during his six-day journey through the 1992 Los Angeles riots. 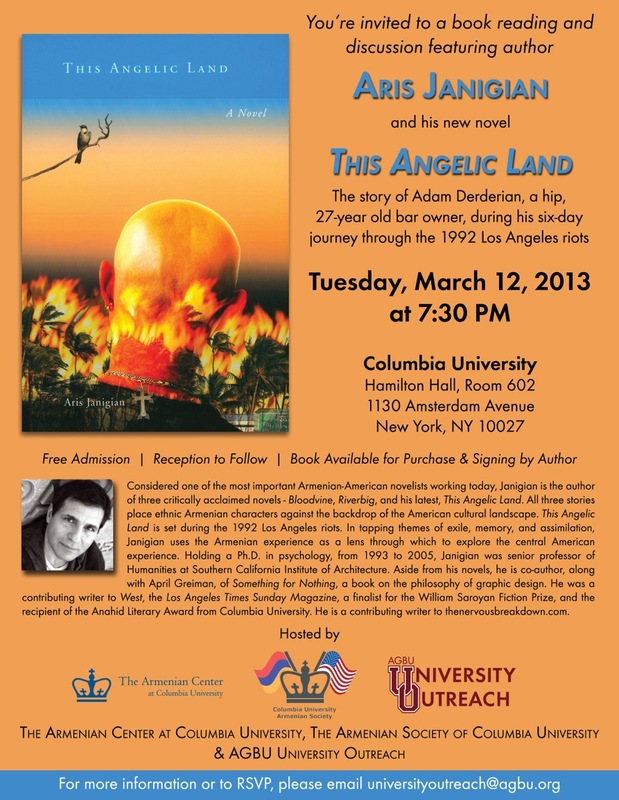 The event will take place at Hamilton Hall 602; Tuesday, March 12 at 7:30pm. Please RSVP by email or through Facebook. 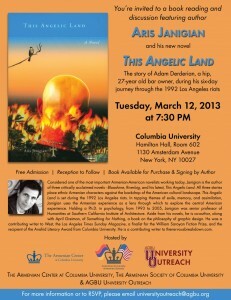 Aris Janigian: Considered one of the most important Armenian-American novelists working today, Janigian is the author of three critically acclaimed novels – Bloodvine, Riverbig, and his latest, This Angelic Land. All three stories place ethnic Armenian characters against the backdrop of the American cultural landscape. This Angelic Land is set during the 1992 Los Angeles riots. In tapping themes of exile, memory, and assimilation, Janigian uses the Armenian experience as a lens through which to explore the central American experience. Holding a Ph.D. in psychology, from 1993 to 2005, Janigian was senior professor of Humanities at Southern California Institute of Architecture. Aside from his novels, he is co-author, along with April Greiman, of Something for Nothing, a book on the philosophy of graphic design. He was a contributing writer to West, the Los Angeles Times Sunday Magazine, a finalist for the William Saroyan Fiction Prize, and the recipient of the Anahid Literary Award from Columbia University. He is a contributing writer to thenervousbreakdown.com. 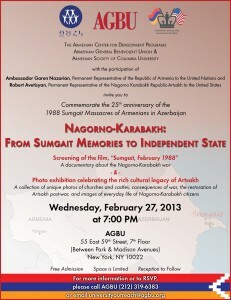 You are kindly invited to attend the upcoming event commemorating 25th anniversary of Sumgait Massacres of 1988. A short film will be screaned together with an exhibition of unique photos from Artsakh. Robert Avetisyan, Permanent Representative of Nagorno-Karabakh Republic – Artsakh to the United States. Connecting worlds and circulating knowledge with CU Armenian students and Luys Foundation. 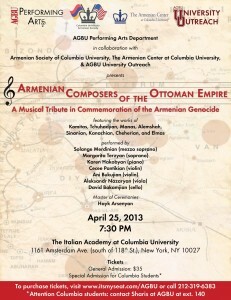 During the event Luys Scholars will present their works at Columbia University. Jacqueline Karaaslanian – the Executive Director of Luys Foundation – will talk about the foundation and its current activities and future plans. 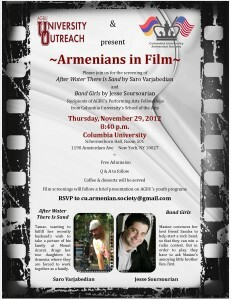 The event will take place at Columbia University Ware Lounge 6th floor of Avery Hall on December 15, 2012 from 3:00 to 5:30pm. For more information about the Luys Foundation please visit www.luys.am. You can download the pdf flier of the event here. 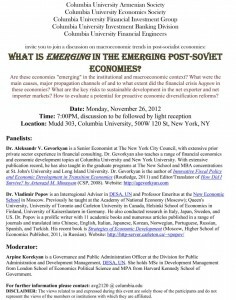 What is Emerging in the Emerging Post-Soviet Economies? Are these economies “emerging” in the institutional and macroeconomic context? What were the main causes, major propagation channels of and to what extent did the financial crisis happen in these economies? What are the key risks to sustainable development in the net exporter and net importer markets? How to evaluate a potential for proactive economic diversification reforms? 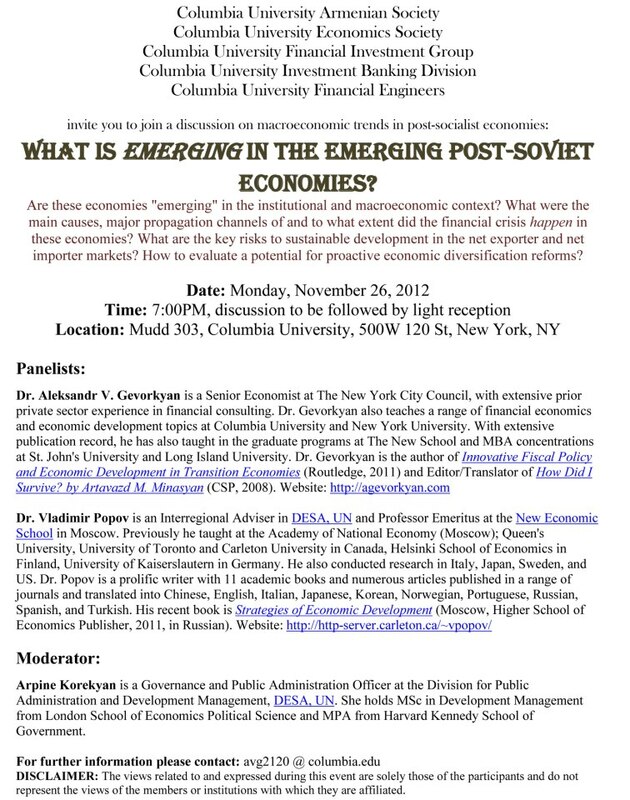 Panelists: Dr. Aleksandr V. Gevorkyan is a Senior Economist at The New York City Council, with extensive prior private sector experience in financial consulting, Dr. Vladimir Popov is an Interregional Adviser in DESA, UN and Professor Emeritus at the New Economic School in Moscow. Moderator: Arpine Korekyan is a Governance and Public Administration Officer at the Division for Public Administration and Development Management, DESA, UN. She holds MSc in Development Management from London School of Economics Political Science and MPA from Harvard Kennedy School of Government. 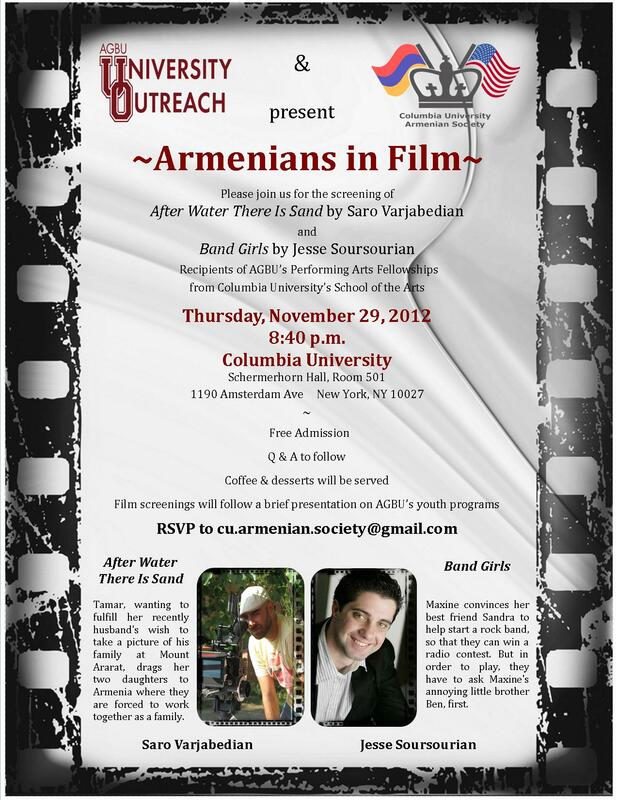 The panel discussion is co-sponsored by the Armenian Society of Columbia University, Columbia University Economics Society, Columbia University Financial Investment Group, Columbia University Investment Banking Division, Columbia University Financial Engineers. 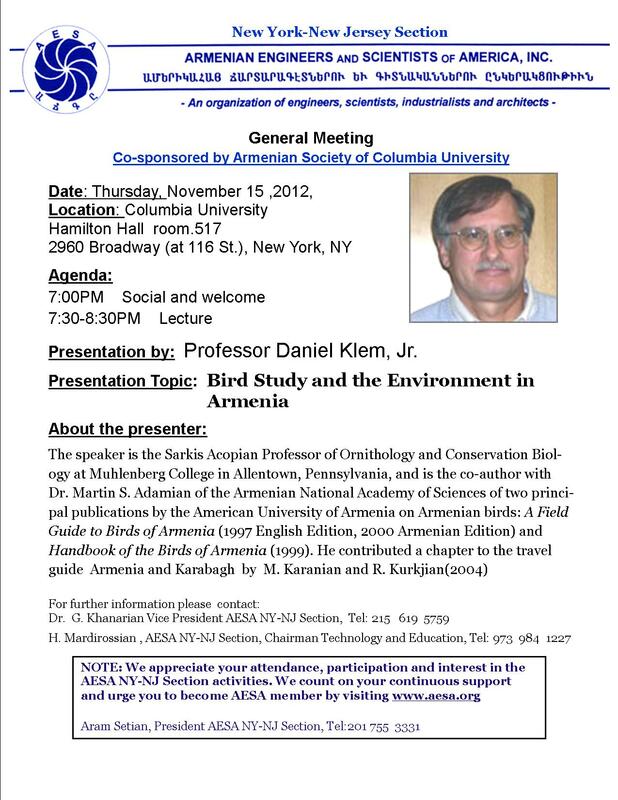 “Bird Study and the Environment in Armenia” Lecture by Professor Daniel Klem, Jr. The speaker is a member of the renown Sarkis Acopian Foundation, professor of Or- nithology and Conservation Biology at Muhlenberg College in Allentown, Pennsyl- vania, and is the co-author with Dr. Martin S. Adamian of the Armenian National Academy of Sciences of two principal publications by the American University of Ar- menia on Armenian birds: A Field Guide to Birds of Armenia (1997 English Edition, 2000 Armenian Edition) and Handbook of the Birds of Armenia (1999). He con- tributed a chapter to the travel guide Armenia and Karabagh by M. Karanian and R. Kurkjian(2004). The lecture is organized by the Armenian Engineers and Scientists of America; co-sponsored and hosted by the Armenian Society of Columbia University. 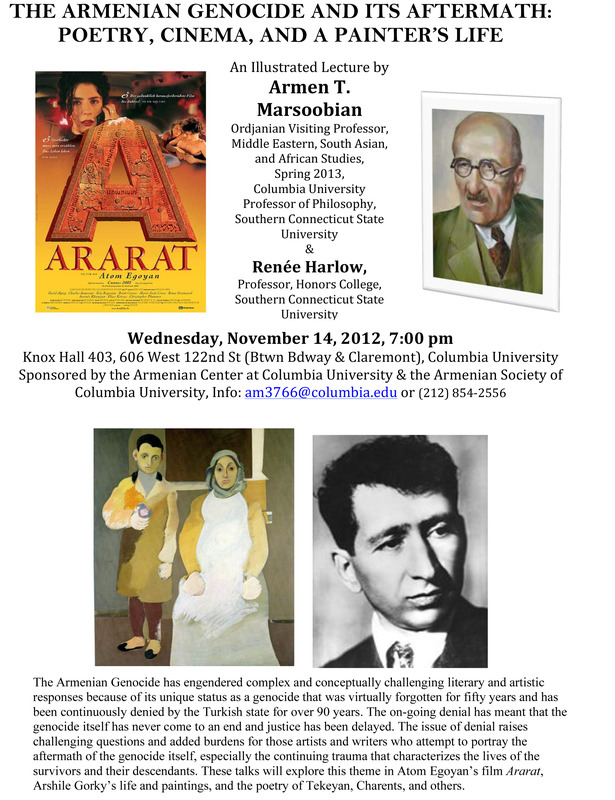 The lecture is co-sponsored by the Armenian Society of Columbia University.